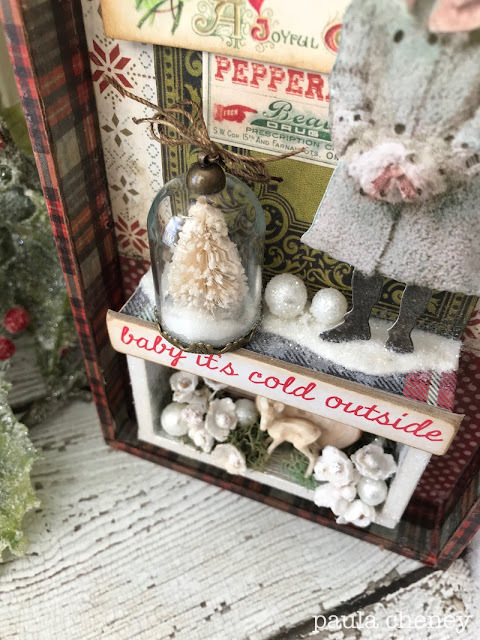 Just a quick pop in today to share the small vignette tray I created for Facebook Live back in the fall. She has been a favorite of students when I have shared her in class so I thought I could pass on some information about how I made it! It's definitely a project you could put together in an afternoon! I started by painting the small tray with Fired Brick Distress paint (but any red color would do). 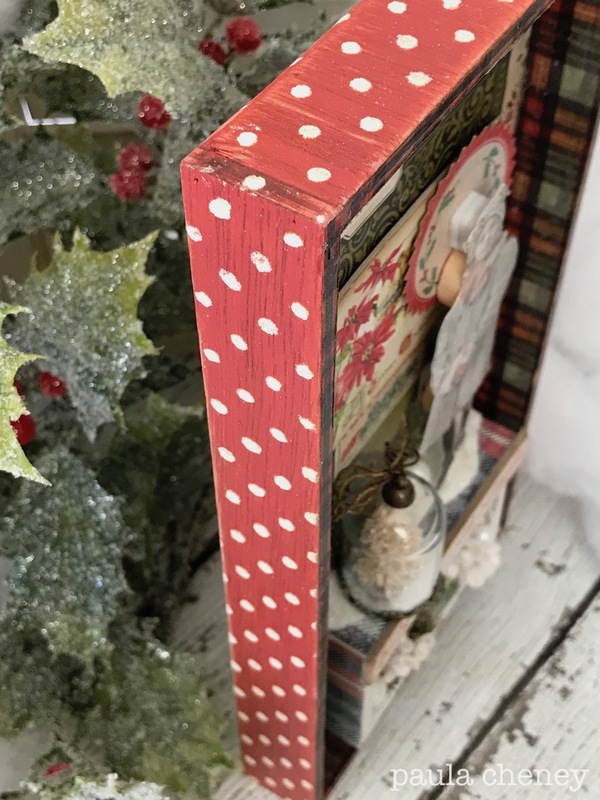 Once dry I used a palette knife and the Stampers Anonymous Polka Dot stencil to add the Grit-Paste over the red paint. This is tricky because you need about 4 hands but I did it so I know you can too! The hardest part is really the dry time between sides of the tray (in other words I let mine dry on one side before I moved on to the next side). I just worked on getting the pieces ready for the inside while the outside was drying. 1. The box at the bottom is the smallest box from the Vignette Box set. I painted the front lip edge and inside walls with Picket Fence Distress Paint. Once the paint was dry I covered the OUTSIDE of the box with patterned paper (you can see this in the next photo). 2. 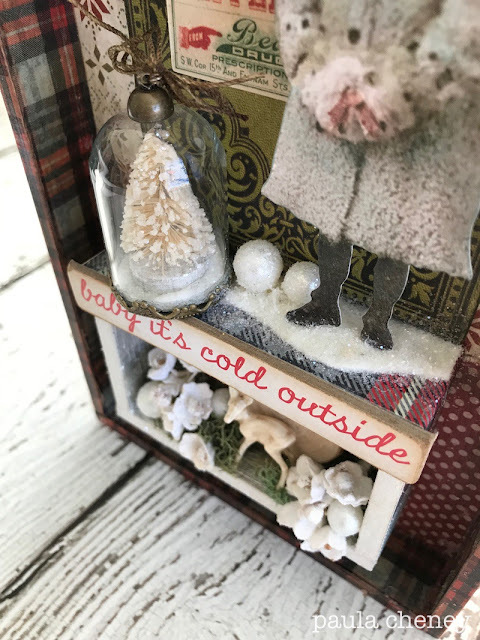 Add a piece of ephemera to the back of the box with Collage Medium. 3. Paint Collage Medium on the front lip edge of the box and sprinkle it with Clear Rock Candy glitter. 4. 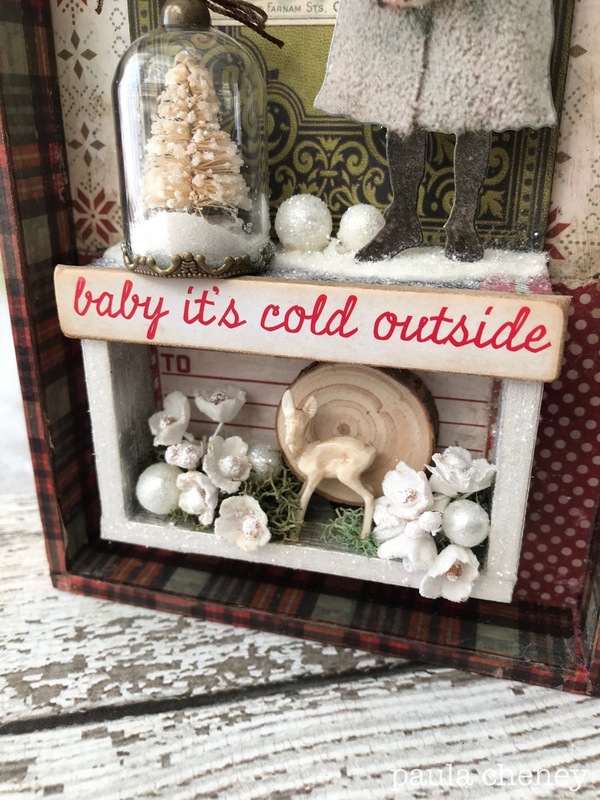 Add the Quote Chip, "baby it's cold outside"from the Christmas Quote Chips. Make sure the Quote Chip is flush with the edge of the box so the Decorative Dome can sit on top of it. 5. The inside of the box can be decorated how you wish. I used a Wood Slice, a small Decorative Deer and flower bunches from the Bouquet pack. I wiped each flower with Collage Medium and immersed it in Clear Rock Candy glitter (hard to see the sparkle in the photo though). 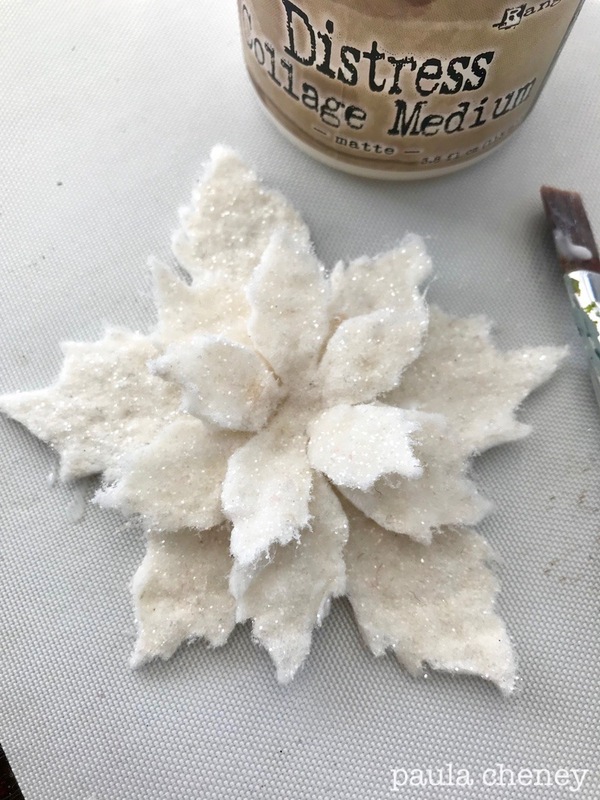 There are a few Baubles that I also rolled in Collage Medium and Clear Rock Candy to look like snowballs. 6. I added the plaid Design Tape to the inside of the tray (you could also use paper for the step) as well as patterned paper for the background. Now you are ready to add everything else!! 7. 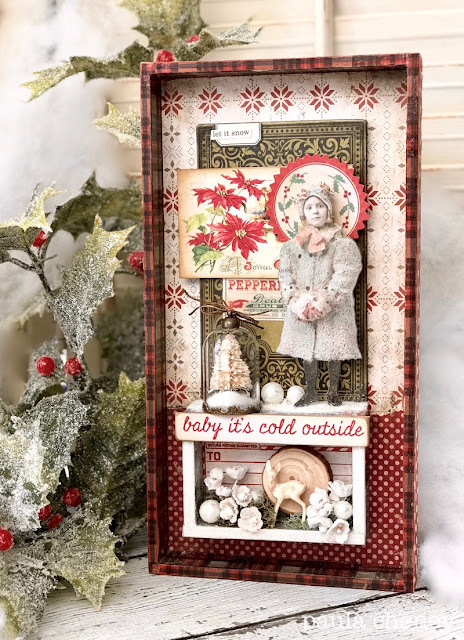 Adhere the small Vignette Box to the inside of the tray with Collage Medium. 8. Add a small piece of Warm And Natural (thin cotton batting) to the top of the small box. The batting does NOT run under the dome. If it does, it tends to tip the dome forward. Paint the batting with Collage Medium and sprinkle with Clear Rock Candy. 9. Paint the base of a Mini Tree white. Glue it to the metal base of the Decorative Dome. Let dry. 10. Run a bead of Glossy Accents around the inside edge of the metal base. Then add a very small amount of Clear Rock Candy to the glass dome. In a very quick motion add the two pieces together capturing the "snow" inside. The Glossy Accents will dry clear. Do not pick up until the glue is dry! 11. Adhere the green Baseboard to the back of the tray with foam squares. 12. Adhere ephemera pieces to the green Baseboard. I mounted the poinsettia ephemera onto chipboard and used thin foam squares to mount it to the Base board. 13. 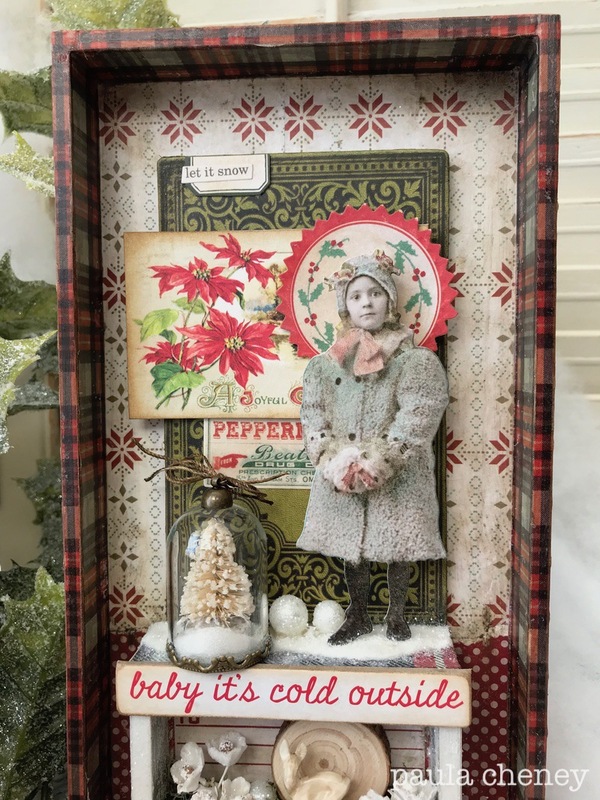 The Paper Doll (my favorite) has been colorized with Distress Markers then placed onto the small box with a double stack of foam squares so she is sitting out in front of the ephemera. Layers, layers, layers! I hope this gives you a few ideas on how to use up your Christmas stash. I know many pieces could be changed up to things you have on hand (I think I have enough stuff on my table right now to create another one, lol). I'm here today sharing another project for the Tim Holtz Holiday Inspiration series! I hope you have been joining us the past few weeks for all the wonderful inspiration! ...and just in case you missed any of the projects, Tim's posts a recap on his BLOG each Saturday. 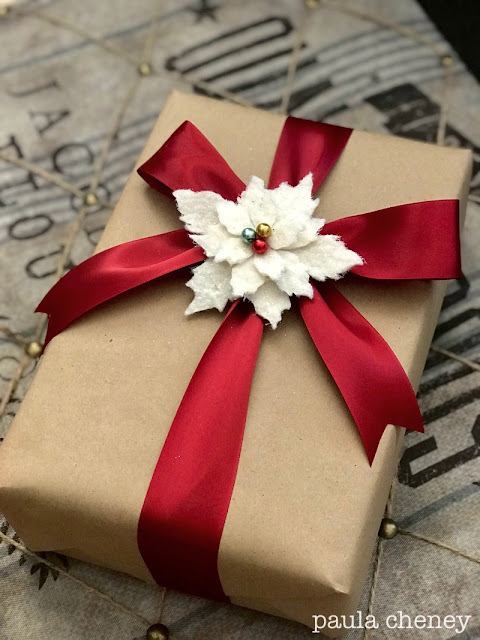 Today I have an easy wrapping idea using the Layered Tattered Poinsettia Bigz die. 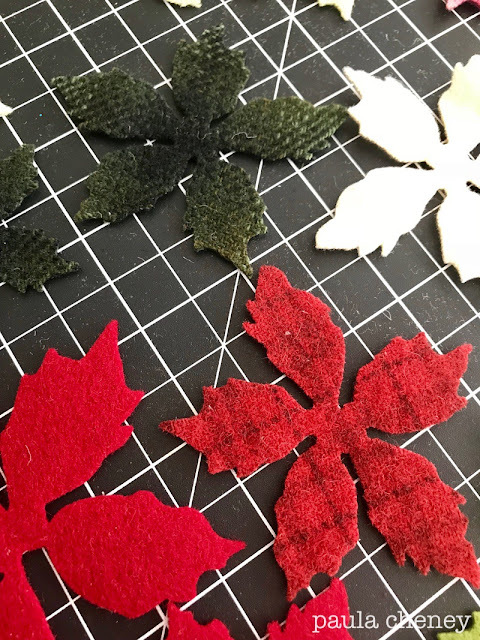 The die is a Bigz which means you can cut thicker material (like felt and wool) with ease. 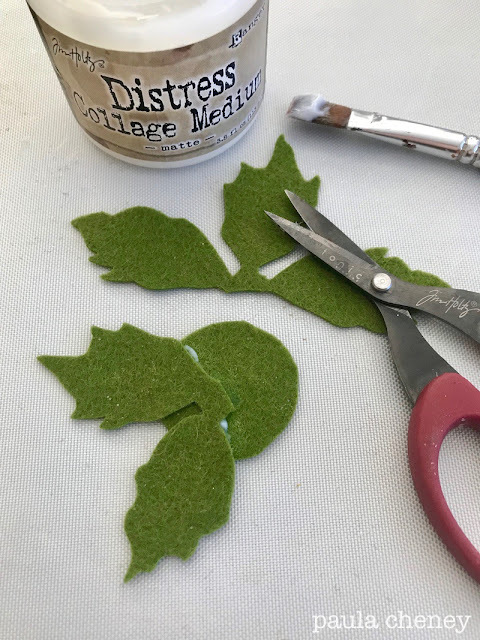 I personally like to use Wool Felt not acrylic felt when I am die cutting. I find the wool felt gives you a better cut and the wool itself is sturdier so it holds up better. I have a stash of plaid wool that I have purchased over the years when I find it at quilt shops. The plaid wool is fun to mix in the layers of the flowers! Please note that not all quilt shops carry wool but when you find one that does, it's hard to stop yourself from wanting it all. I cut solid red as well as red plaid. I also had some pink wool that has light and dark areas that I think will look pretty as a flower. I guess what I like most about this is that the flowers can be any color you want to match your holiday decor. 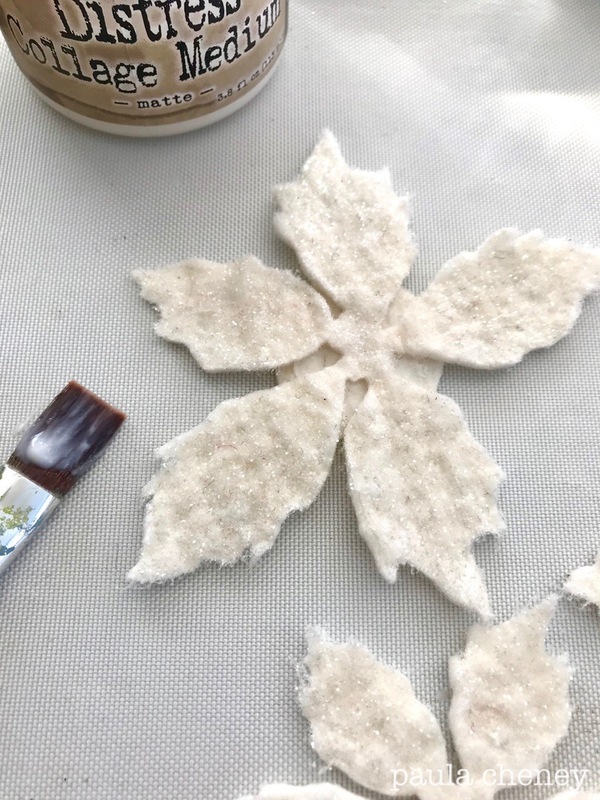 For this bloom I started with pieces cut from Warm and Natural (a type of batting) or you could use white felt. I painted Collage Medium on the leaves with a brush. One by one I moved each layer to a piece of paper then poured Clear Rock Candy Glitter over the top. I let each piece dry then cut a circle for a base. 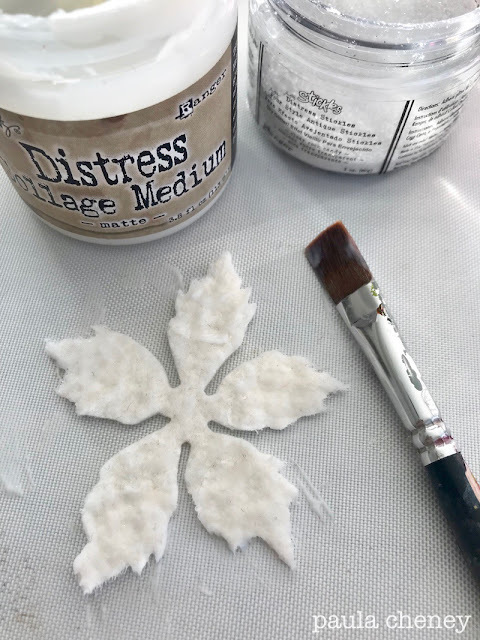 Start building the flower by adhering the largest piece to the circle with Collage Medium. Once the stack was complete I pushed the center in to make a well for beads. 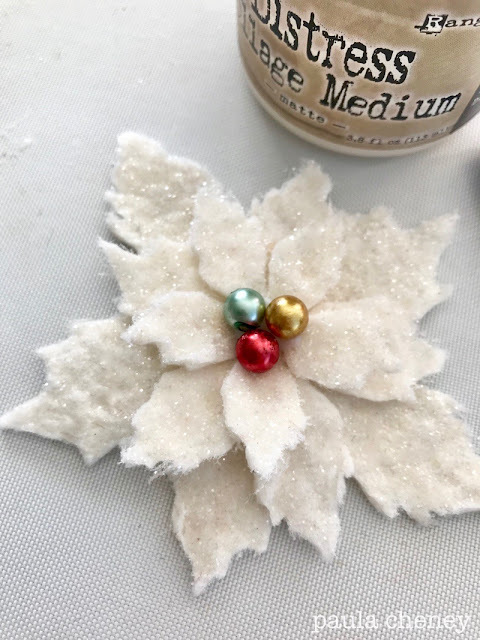 I colored three Baubles for the center of the Poinsettia with Alcohol Ink (juniper, red pepper, and butterscotch) and adhered them with Collage Medium. 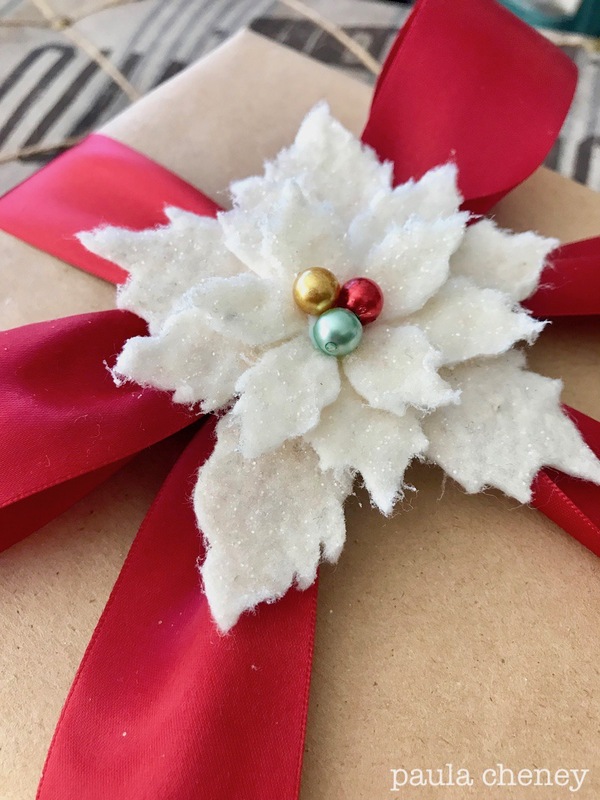 I hand stitched a safety pin to the back of the poinsettia so it could be removed once the gift was opened. 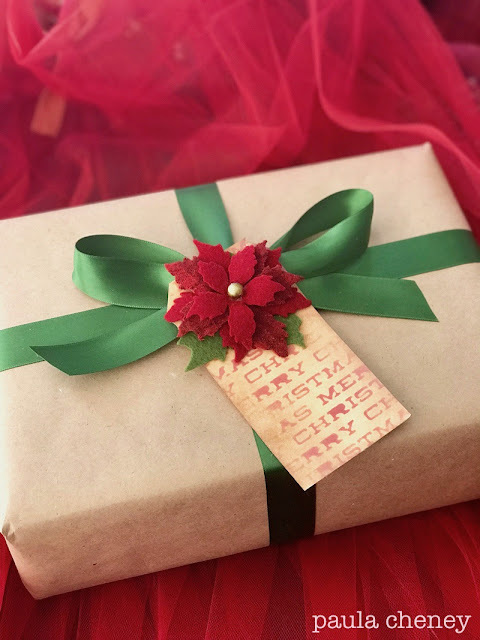 The double faced red satin ribbon is my favorite color of red! 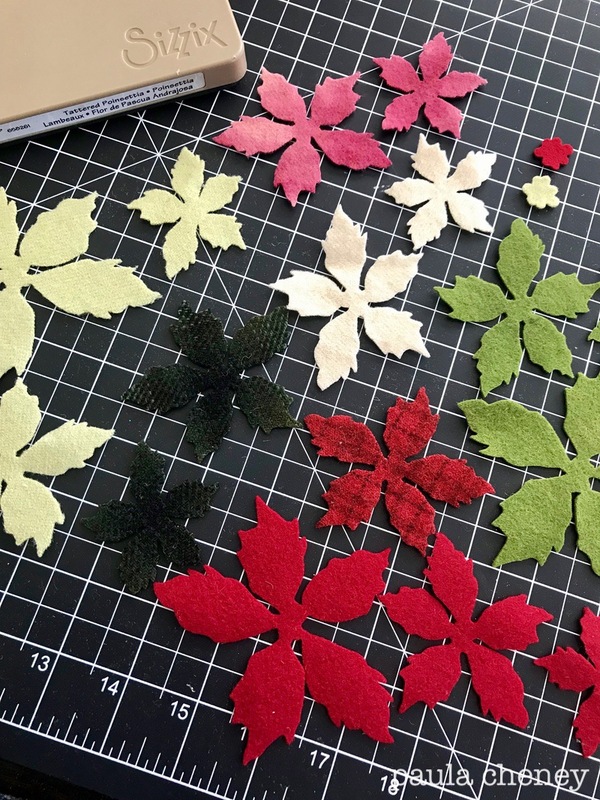 You can make the poinsettia smaller by only using the two smaller sizes of the die cut. I decided to start with leaves cut from one of the large pieces and glued it to a circle. 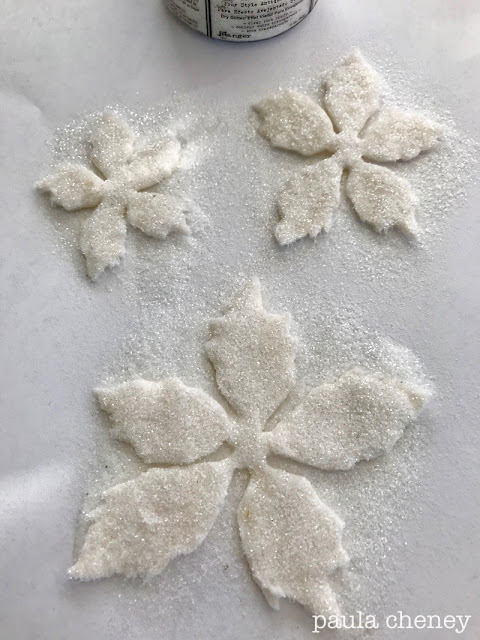 So you can see that only the leaves were cut using the largest pieces - the flower itself is two medium pieces and one small which makes a perfect small poinsettia! The center for this one is also a Bauble. I covered it with Butterscotch Alcohol ink, then once dry dripped a little Mushroom over the top and rolled it around till dry. A perfectly vintage color I think! 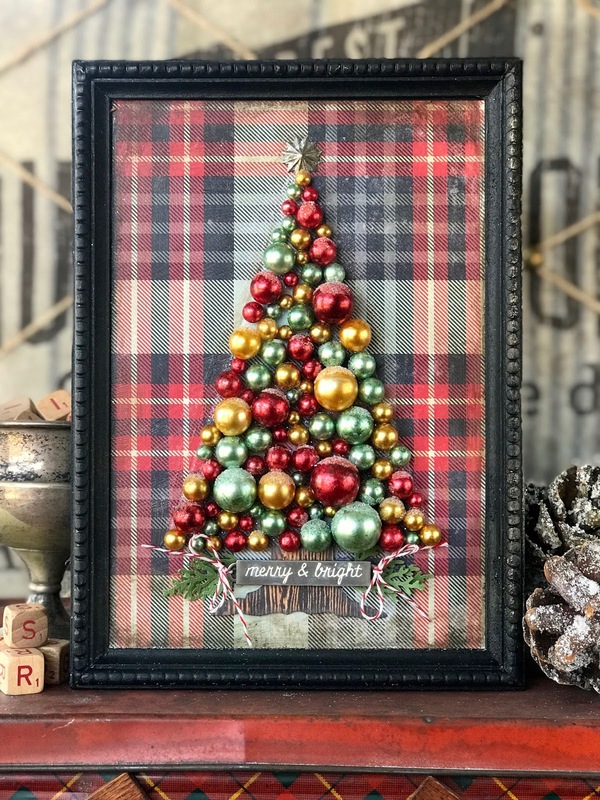 I like the plaid wool layer to this one and I love the addition of the green leaves just peaking out under the bloom. 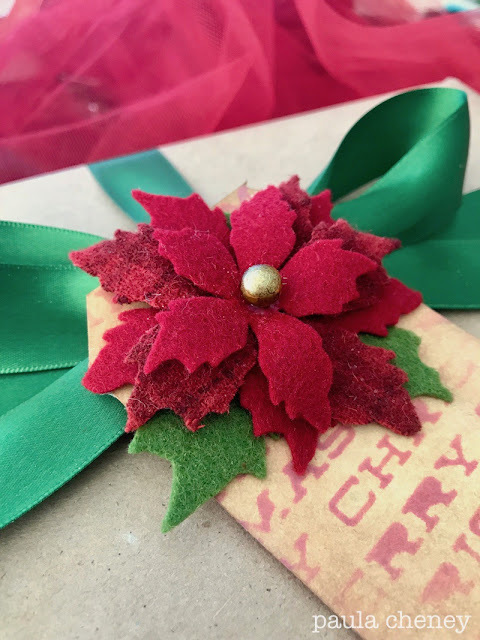 I adhered the poinsettia to a small tag that I made using Oxide Distress Ink and the Merry Christmas stencil. The next one is variegated pink wool. 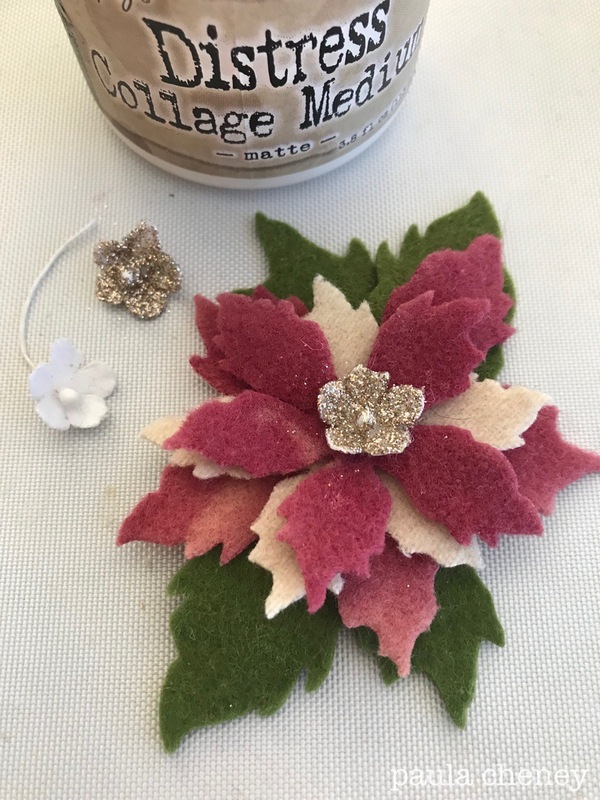 Same layering process but with a glittered Bouquet flower in the center. I used my favorite Vintage Platinum glitter of course. 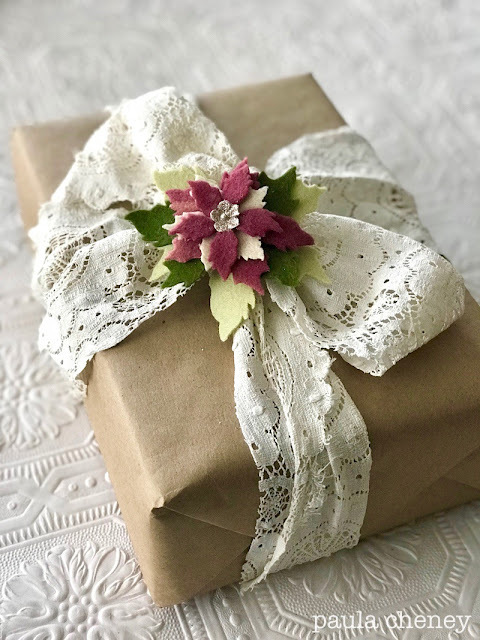 For this gift I used a strip of lace that was cut from a tattered cotton tablecloth I bought from my friend Lisa Mcilvain on Etsy. You might notice I added another yellow/green layer at the bottom of the flower. 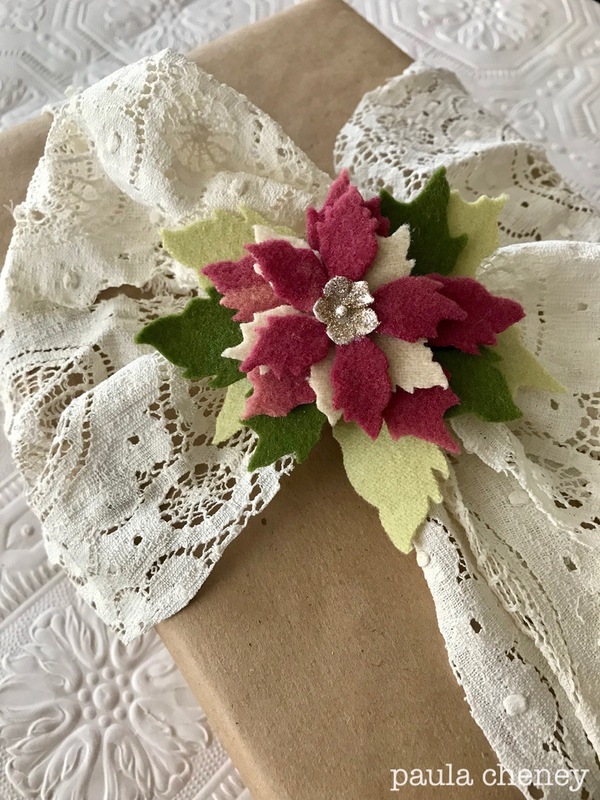 The lace bow was so big that the flower just needed to be a bit bigger! Love the colors of the pink and green on this one. Christmas is just a few short weeks away so I hope this gives you a few ideas for beautiful packaging. I know these would look beautiful under any tree! NOTE: If you don't have a shop in your area that has wool felt - I know Whim So Doodle in Florida carries it in their fabric shop. Just call the store and they will cut and send you what you need - 1/4 yard of a color will make a whole lot of blooms for Christmas!